Everything you need to start playing the electric guitar is in this pack. This new entry-level model electric guitar offers a comprehensive range of guitar features with a quality of craftsmanship and tone. A great place to start your electric guitar journey. 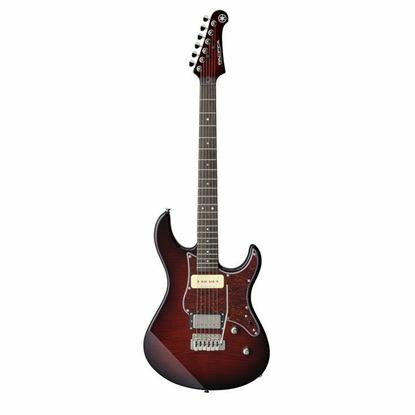 The Yamaha Pacifica PAC112J series offers the excellent build quality you would expect from Yamaha along with great looks and killer tone. The class-leading Pacifica 112V combines player-focused, stage-ready spec with no-compromise construction and set-up to create the best value player's guitar on the market. Out of the blocks jumps the Yamaha Revstar Series - solid, fantastic quality for the price and with a range of stunning finishes that stand out in the crowd. A quality mid-price guitar. With authentic Seymour Duncan pickups and Californian session style, the Yamaha Pacifica 611VFM is a versatile and stylish electric guitar that performs well above its price.